The October 2017 Northern California wildfires, also known as the Northern California firestorm, North Bay Fires, and the Wine Country Fires were a series of 250 wildfires that started burning across the state of California, United States, beginning in early October. Twenty-one became major fires that burned at least 245,000 acres (99,148 ha). The wildfires broke out throughout Napa, Lake, Sonoma, Mendocino, Butte, and Solano Counties during severe fire weather conditions, effectively leading to a major red flag warning for much of the Northern California area. Pacific Gas and Electric reported that red flag conditions existed in 44 of the 49 counties in its service area. Seventeen separate wildfires were reported at that time. 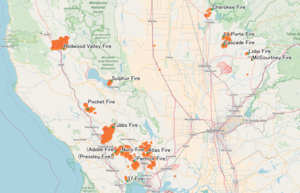 These fires included the Tubbs Fire (which grew to become the most destructive wildfire in the history of California up until that time - fires in 2018 were more destructive), the Atlas Fire, Nuns Fire, and others. These wildfires were also the most destructive ones of the 2017 California wildfire season. The October 2017 fires were the costliest group of wildfires on record, causing around $14.5 billion (2017 USD) in damages, including $11 billion in insured losses and $1.5 billion in fire suppression costs, surpassing the 1991 Oakland firestorm, which until then had been the single costliest fire on record. In addition, the Northern California fires were predicted to cost the US economy at least $85 billion. Owing to the extreme conditions, shortly after the fires ignited on October 8 and 9, they rapidly grew to become extensive, full-scale incidents spanning from 1,000 acres (400 hectares) to well over 20,000 acres (8,100 ha), each within a single day. By October 14, the fires had burned more than 210,000 acres (85,000 ha) while forcing 90,000 people to evacuate from their homes. In total, the Northern California fires killed 44 people and hospitalized at least 192 others, making this one of the deadliest wildfire events in the United States during the past century. Days prior to the wildfires, the National Weather Service had begun issuing red-flag warnings throughout much of northern California as conditions were expected to become extremely volatile, with winds expected to be gusting between 25 and 35 miles per hour (40 and 56 km/h) from the north to the south. By the evening of October 8, the Diablo winds were reported gusting up to 70 miles per hour (110 km/h) within the affected areas as over a dozen wildfires began to break out. Many of those killed in the fires are believed to have died late on October 8 or early on October 9, 2017, when most of the fires broke out overnight. Most of the victims were elderly, though the ages of the victims ranged from 14 to 100 years old. On October 9, California governor Jerry Brown declared a state of emergency for the counties of Napa, Sonoma, Yuba, Butte, Lake, Mendocino, Nevada, and Orange, and sent a letter to the White House requesting a major disaster declaration. President Donald Trump approved the disaster declaration on October 10. That evening, Gov. Brown issued an emergency declaration for Solano County. Surveying the region, representative Mike Thompson of California's 5th congressional district said, "I fully expect this will be the worst fire disaster in California history." More than 10,000 firefighters battled the blaze, using more than 1000 fire engines and other equipment, with crews arriving from as far away as Canada and Australia. Pacific Gas and Electric Company (PG&E) reported mobilizing 4,300 workers to restore power. It also said that more than 350,000 customers had lost electric service and 42,000 customers gas service since the wildfires began on October 8. By October 14, PG&E had restored electricity to 92% and gas service to 16,800 of the customers affected. Reinsurance broker Aon Benfield stated that these are the costliest wildfires in U.S. history, with an estimated eight billion U.S. dollars in insured losses. The largest portion of these losses was to residential property. Additional losses were to automobiles, commercial property including business interruption insurance, and to crops. Many of the losses were in urban areas not historically prone to wildfire exposure. By October 12, the air quality in the city of Napa was ranked the poorest in the nation, due to high levels of particulates and ozone. By October 13, air quality in the city reached the "hazardous" level, the most dangerous on the Environmental Protection Agency scale. In Solano County, over 250 people were sickened by smoke inhalation, and sought care at hospitals. Twenty-three were admitted to emergency rooms. By October 12, smoke from the wildfires had spread nearly 100 miles, with "unhealthy" air quality indices registered in the cities of Oakland, San Francisco, and San Rafael. Due to the poor air quality, San Francisco State University canceled classes, and outdoor activities were canceled in a number of cities, including Danville, Palo Alto, and Walnut Creek. Visibility issues spurred the Federal Aviation Administration to implement a ground delay program at San Francisco International Airport, and nearly 280 flights were canceled over a three-day period. Over a week after the fires started, flights continued to be canceled and delayed due to poor visibility from the smoke. The Cherokee Fire broke out on the evening of Sunday, October 8, near Oroville in Butte County just after 9 PM PDT. Reportedly igniting near Cherokee Road, the fire quickly expanded from hundreds to thousands of acres within a few hours of burning as it threatened nearby Oroville and surrounding rural neighborhoods. Aerial view of smoke from the 2017 fires in Napa and Sonoma Counties, California, on October 12 from near the south end of Lake Berryessa, nearest to the Atlas fire and looking toward the Nuns fire. Point Reyes is visible in the distance. The Atlas Fire burned Napa County, north of the city of Napa, near Napa Soda Springs. On October 29, the fire had burned 51,057 acres and was 100% contained. 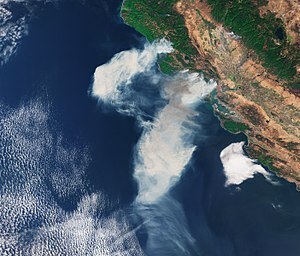 The Nuns Fire, centered in the areas to the east and north of the city of Sonoma, merged with the Norrbom fire on October 11. The Adobe fire merged with Nuns/Norrbom on October 12. The Partrick fire joined the four-fire conflagration on October 13. By October 16, the combined fire, which now also included the Pressley fire, covered over 48,000 acres. On October 18, the Oakmont Fire merged into the Nuns Fire, and the combined fire grew to over 54,000 acres in size. Based on the investigation by CalFire, it has been found that Pacific Gas & Electric equipment was the cause of all of the individual fires except for the Tubbs Fire. In January 2019 CalFire determined the Tubbs Fire was caused by incorrectly maintained electrical equipment owned by a private landowner. News media noted reports of wind-damaged power equipment around the time the fires were starting. Pacific Gas & Electric stated that strong winds had affected the utility's power lines in the North Bay area on late October 8 and early October 9. A California Department of Forestry and Fire Protection (CAL FIRE) spokesperson stated that investigators were considering this among other possible causes. The California Public Utilities Commission sent PG&E a notification to preserve equipment, emails, and documents relevant to the utility's tree-trimming program. CAL FIRE Director Ken Pimlott discouraged premature speculation of causes, stating that, "The facts will come out when the investigations are done." ^ a b c d e f g h i j k "California Statewide Fire Summary". CAL FIRE. State of California. Retrieved October 30, 2017. ^ a b c Emslie, Alex (29 November 2017). "October Fires' 44th Victim: A Creative, Globetrotting Engineer With 'the Kindest Heart'". KQED News. Retrieved December 1, 2017. ^ a b "Hospitals say at least 185 treated for injuries". Wilx10 News. October 10, 2017. Retrieved December 9, 2017. ^ a b "Bear Fire". CAL FIRE. October 19, 2017. Retrieved May 26, 2018. ^ "One death and 1,500 structures lost in Northern California firestorm, among worst in state's history". Los Angeles Times. October 9, 2017. Retrieved 9 October 2017. ^ a b c "Power-line restart device scrutinized". San Francisco Chronicle. November 2, 2017. p. A10. ^ Fuller, Thomas; Bromwich, Jonah Engel; Turkewitz, Julie (October 10, 2017). "Wildfires Sweep Across Northern California; 13 Are Dead". The New York Times. Retrieved October 10, 2017. ^ a b "Top 20 Most Destructive California Wildfires" (PDF). CAL FIRE. Retrieved October 20, 2017. ^ Jonathan J. Cooper (December 7, 2017). "October's Wine Country Fires Were the Costliest Ever". TIME Money. Retrieved December 9, 2017. ^ "Devastating California wildfires predicted to cost US economy $85 billion; Containment may take weeks". Fox News Weather Center. October 13, 2017. Retrieved December 11, 2017. ^ a b "California firefighters battle winds as number of people evacuated hits 90,000". The Guardian. Associated Press. October 14, 2017. Retrieved October 14, 2017. ^ FOX. "California wildfires by the numbers: 40 killed, 5,700 homes destroyed". KTVU. Retrieved 2017-10-16. ^ a b c d Uria, Daniel; DuVall, Eric (October 14, 2017). "California wildfire death toll rises to 38, earthquake hits Mendocino County". UPI. Retrieved October 14, 2017. ^ "Northern California Wildfires: Emergency Alerts Scrutinized Amid Deadly Blazes". NBC News. Associated Press. October 12, 2017. Retrieved October 12, 2017. ^ "California fires: deadliest week in history kills 31 as blaze rages on". The Guardian. Associated Press. October 12, 2017. Retrieved October 12, 2017. ^ a b c d Ho, Vivian; Lyons, Jenna (15 October 2017). "Live updates: Northern Calif. wildfires cause estimated $3 billion damage; death toll still 40". San Francisco Chronicle. Retrieved 16 October 2017. ^ "Red Flag Warnings". CAL FIRE. October 7, 2017. Retrieved October 7, 2017. ^ Lin II, Rong-Gong (October 9, 2017). "'Diablo winds' fuel widespread destruction from fires in California wine country". Los Angeles Times. Retrieved October 9, 2017. ^ a b "Firefighters beating back deadly California wildfires, official says". The Guardian. Associated Press. October 15, 2017. Retrieved October 15, 2017. ^ a b c d e Lyons, Jenna; Rubenstein, Steve; Aleaziz, Hamed; Fimrite, Peter; Tucker, Jill (October 11, 2017). "Live updates: 23 dead in Wine Country fires; parts of city of Napa warned". San Francisco Chronicle. Retrieved October 11, 2017. ^ Wong, Julia Carrie; Gee, Alastair (October 9, 2017). "California wildfires: 10 killed in 'unprecedented' wine country blaze". The Guardian. Retrieved October 9, 2017. ^ Ling, Danielle (November 21, 2017). "2017 to be one of the costliest catastrophe loss years ever, Fitch says". Property Casualty 360°. ALM Media, LLC. Retrieved November 21, 2017. ^ a b c Lyons, Jenna; Rubenstein, Steve; Gutierrez, Melody (October 12, 2017). "Live updates: Fire death toll at 29 in Northern California fires". San Francisco Chronicle. Retrieved October 12, 2017. ^ a b Lyons, Jenna; Ma, Annie; Egelko, Bob; Gutierrez, Melody (October 13, 2017). "Live updates: Death toll rises to 32 in Northern California wildfires". San Francisco Chronicle. Retrieved October 13, 2017. ^ Ioannou, Filipa (October 13, 2017). "Wildfire smoke continues to delay, cancel flights at SFO". San Francisco Chronicle. Retrieved October 13, 2017. ^ Ioannou, Filipa (October 17, 2017). "Smoke continues to cause delays and cancellations at SFO". San Francisco Chronicle. Retrieved October 17, 2017. ^ "Cherokee Fire". CAL FIRE. October 8, 2017. Retrieved May 26, 2018. ^ a b c "Atlas Fire". CAL FIRE. October 8, 2017. Retrieved May 26, 2018. ^ "Tubbs Fire". CAL FIRE. October 9, 2017. Retrieved May 26, 2018. ^ a b "Nuns Fire". CAL FIRE. October 9, 2017. Retrieved May 26, 2018. ^ "Redwood Fire". CAL FIRE. October 9, 2017. Retrieved May 26, 2018. ^ "La Porte Fire". CAL FIRE. October 9, 2017. Retrieved May 26, 2018. ^ "Cascade Fire". CAL FIRE. October 9, 2017. Retrieved May 26, 2018. ^ "Sulphur Fire". CAL FIRE. October 9, 2017. Retrieved May 26, 2018. ^ "Pocket Fire". CalFire. October 12, 2017. Retrieved May 26, 2018. ^ "Lobo Fire". Inci Web. Retrieved October 9, 2017. ^ "Crews Working Fast-Moving Fire in Oroville Near Cherokee Road". FOX 40. October 9, 2017. Retrieved October 9, 2017. ^ "Santa Rosa mayor: 2,834 homes destroyed in Tubbs Fire". KCRA. October 12, 2017. Retrieved October 12, 2017. ^ "Fire destroys Paradise Ridge Winery, Fountaingrove Inn, Willi's Wine Bar, other local landmarks". The Press Democrat. October 9, 2017. Retrieved October 9, 2017. ^ "Incident Update" (PDF). Cal Fire. October 12, 2017. Retrieved October 13, 2017. ^ "Cal Fire: PG&E equipment caused 12 Northern California fires". Santa Rosa Press Democrat. 2018-06-08. Retrieved 2018-06-10. ^ Callahan, Mary (January 24, 2019). "Cal Fire: Private equipment, not PG&E, caused Tubbs fire". Santa Rosa Press Democrat. Retrieved January 24, 2019. ^ a b c Albarazi, Hannah (12 October 2017). "Downed lines, equipment failures among possible causes of Northern California wildfires". CBS San Francisco. Retrieved 15 October 2017. ^ Smith, Dakota (11 October 2017). "Cause of raging Northern California fires remains under investigation, officials say". Los Angeles Times. Retrieved 15 October 2017. ^ Baker, David R. (October 12, 2017). "California regulators tell PG&E to preserve fire evidence". San Francisco Chronicle. SFGate. Retrieved November 22, 2017. This page was last edited on 2 April 2019, at 19:25 (UTC).